Inequality among cities and regions in the developed world – after falling in the 1990s from high levels in 1980 – has turned sharply up again since beginning of the millennium. Many small and medium-sized manufacturing cities and regions have suffered relative employment and income declines. Their surrounding suburban or rural areas have also stagnated. In contrast, many large metropolitan areas, including their suburbs, which had generally witnessed decline in the 1960s to 1980s, are now among the most dynamic places in terms of incomes and employment creation. In Europe, in particular, the panorama is complex. On the one hand, the increasingly familiar dichotomy persists between dynamic large urban agglomerations and decaying industrialised and remote regions. Many industrial and/or peripheral regions have undergone a steady long-term decline in employment and competitiveness, whereas the inner areas of some large metropolitan regions have gained greater shares of high-wage jobs. On the other hand, a number of capital metro regions have been hard hit by the crisis, while some rural and intermediate regions have displayed more resilience (Dijkstra et al. 2015). The result is a finely grained, multi-scale territorial patchwork of diverging real incomes and rates of labour force participation: between states and regions; within regions, between core areas and peripheral areas; and between prosperous metropolitan regions and less prosperous ones. Increasing inter-regional inequality is the outcome of two forces. The first is related to the long-cycle of development in the economic structure. The major wave of technological innovation that began in the 1970s has stimulated the concentration of high-technology and knowledge-intensive sectors in large metropolitan areas, favouring the mobility of highly skilled, non-routine and creative jobs towards economic cores. The increasing automation of previously dominant manufacturing industries has revolutionised trade costs and resulted in the substitution of routinised medium- and low-skilled jobs in most of the former industrial hubs of Europe. Manufacturing activity has become more geographically dispersed – and increasingly outsourced to third countries – leading to the demise of the more routine industry jobs across most of Europe. The second type of force is the long-cycle of regional evolutionary features, consisting of place-specific endowments of people and skills, firms and industries, formal and informal institutions, capabilities for innovation, and their reaction to change (Storper 2018). The rise in inequality has put Europe in a territorial conundrum. On the one hand, Europe must continue to sustain the prosperity of its most dynamic regions in order to assert its economic stand in the world. On the other, persistent territorial inequality is economically inefficient and, in the words of The Economist, has become too politically [and socially] dangerous to ignore. In a recent paper, we look at how to address this conundrum (Iammarino et al. 2018). The interaction of economy-wide forces and regional characteristics creates a geography made up of countries, regions, and city-regions that are at different structural positions in the wider economy’s ladder of roles and functions (Scott and Storper 2003) and form different development ‘clubs’. Club theory addresses the uneven pattern of development and the core questions of sustaining prosperity in leading regions while enhancing it in other regions. It is a way of generating powerful insights into development and a distinctive perspective on policy. European regions can be allocated into different economic clubs, depending on their level of development: regions with very high per capita personal income (PCPI) (very high); regions with high PCPI (high); regions with medium PCPI (medium); and those with low PCPI (low) (Figure 1). The very-high (VH) income club is dominated by large metropolitan and capital city-regions and includes several additional areas, generally highly urbanised in the form of a network of cities (e.g. Randstad in Holland), specialised in high-quality goods and services. Many of these regions are attracting population and have high productivity growth. Regions in this club tend to be ‘overperformers’ – over the long-term they outperform their national average – generating more than their share of European wealth (Figure 2). The high-income (H) club shares many, but not all, characteristics with the VH group. These regions are less metropolitan or city-centred and somewhat less dynamic demographically. Their employment rates are high and many have satisfactory productivity growth. 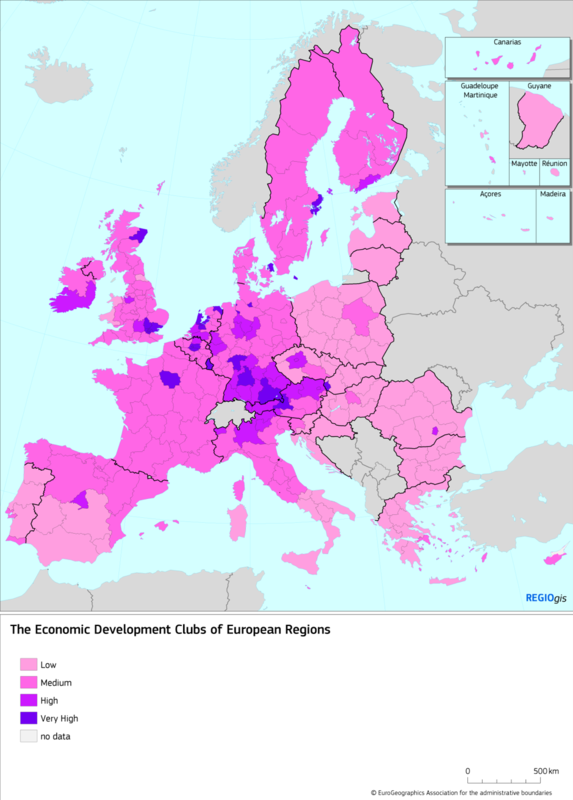 The medium-income (M) club is vast and comprises most parts of northwestern Europe that remain outside the VH and H clubs. There are two broad sub-groups within this category. The largest covers regions that have lost manufacturing jobs, which is reflected in stagnant or declining employment rates. Population growth is low or even negative in some of these regions, so unemployment rates vary. Education levels – attainment of secondary and tertiary education – are below those of the H and VH clubs. Overall, these are economically fragile regions, displaying a combination of declining manufacturing, unsatisfactory attainment of education and skills, and inadequate labour-force participation. The second sub-group stands out because it is experiencing population growth. In-migration brings income (via people-based fiscal transfers in the form of pensions and health benefits), and spending has a local multiplier effect, mainly in the demand for services. Labour-force participation, however, remains low. More importantly, the types of employment stimulated, in mostly non-tradeable local services, involve limited skill development, innovation potential, and exportability. The low-income (L) club consists of large swathes of eastern and southern Europe. These regions share some common characteristics in terms of low employment rates and poor quality of government, low investment in R&D and a relative lack of accessibility. They have also experienced divergent economic trajectories in recent years. This has led the European Commission (2017) in its Lagging Regions report to distinguish between ‘low-income’ and ‘low-growth’ regions. Overall, each club offers a distinctive set of attributes and near-term developmental constraints and opportunities that imply that no one-size-fits-all policy is likely to succeed in addressing the pervasive territorial disparities that are undermining overall economic growth and fermenting the rise of populism across Europe (Rodríguez-Pose 2018). But what does existing theory offer on how best to tackle existing territorial inequality? Mainstream economic theories – and, particularly, endogenous growth, new economic geography, and evolutionary economic geography – all point to greater agglomeration and density generating positive externalities which are behind the dynamism of large cities and regions (Fujita et al. 1999, Duranton and Puga 2001, Glaeser 2011). Hence, recently the dominating policy strand has been that efficiency is paramount and that equity may derive from greater efficiency. As indicated by Glaeser (2011: 1), “urban density provides the clearest path from poverty to prosperity”. Spatially uneven development is thus regarded as the price to pay for economy-wide productivity maximisation – the overarching goal is to make the economic cake bigger first and then distribute it. The distribution mechanisms to less-favoured cities and regions will then take place through knowledge spillovers and labour mobility. However, knowledge spillovers are far from a panacea for the development of declining and lagging behind areas, as the backwash effects driving knowledge creation towards agglomerations are generally greater than those stimulating knowledge diffusion. Furthermore, knowledge transmission suffers from strong distance decay effects (Moreno et al. 2005). Labour mobility is also failing to reduce territorial inequality. Migration – especially within-country – is increasingly adopting a ‘not-so-much, not-for-all, not-for-free’ pattern. Within-country migration trends have remained relatively low in Europe over the last three decades. Worker migration, moreover, is highly dependent on skills and occupation profiles. As productive capital and economic functions reorganise constantly across and within national borders, high-skilled workers in non-routine occupations have more national and international opportunities. Low-skilled individuals in routine jobs, often in less developed areas, are not afforded this luxury and generally just stay put. Consequently, as The Economist observed in a 27 December 2016 article, “orthodox economics has few answers to the problem of regional inequality”. Pursuing efficiency does not guarantee equity, while focusing exclusively on equity could undermine efficiency. There is therefore a need to pursue efficiency and equity at the same time and neither spatially blind nor place-based policies on their own are in a position to do so. Policy alternatives that simultaneously take efficiency and equity into consideration are best positioned to challenge the causes of territorial distress, while at the same time maximising the potential of every territory. Place-sensitive policies are therefore needed to enhance economic development in each territory, creating greater opportunities for the resident population. Place-sensitive policies refer to an innovative development policy approach that is well grounded in the key concepts emanating from development theories and on sound empirical analysis, while sensitive to the characteristics, features, and conditions of the different development clubs. These development clubs require different flexible policy approaches to support the economic development of the most dynamic places in Europe, while at the same time countering the potentially negative spiral of geographically restricted development on three fronts: a) by pushing more and more regions towards more non-routine (innovative) functions in their economic mix; b) by expanding the sources of creativity and satisfaction that are good in and of themselves on human grounds; and c) by stimulating greater investment in basic capabilities that are essential to a dignified and economically viable life. The ultimate goal of place-sensitive development is to maximise the potential for economic development and well-being across a large group of heterogeneous territories, as those found in Europe and in most other parts of the world. This implies combatting the under-utilisation of cities’ and regions’ people and resources, so as to distribute development more widely and exploit a territory’s full development potential. Unlike standard all-agglomeration and all-mobility models, this theoretical framework aims to expand the aggregate potential of the whole of Europe’s economy by un-tapping the potential output of all its regions, taking account of barriers to people mobility and to spreading employment, and spatial traps that have emerged. In particular, tackling what seems to be a growing middle-income trap represents perhaps the hardest challenge for policy today. Identifying middle-income cities’ and regions’ actual needs and potential opportunities between those of the most successful regions, which are indeed sources of wealth for the whole European economy, and the large and diverse group of the more disconnected and disillusioned peripheries is crucial to keep the overall economic dynamism of Europe alive. Redefining how to approach the pervasive problems of uneven development by place-sensitive policies will allow Europe to start addressing some of the economic, social and political challenges which have gradually eroded its capacity to lead on the global scale and which have become all too evident as a source of social division and political disenchantment in recent years. Dijkstra, L, E Garcilazo and P McCann (2015), “The effects of the global financial crisis on European regions and cities”, Journal of Economic Geography 15(5): 935-949. Duranton, G and D Puga (2001), “Nursery cities: urban diversity, process innovation, and the life cycle of products”, American Economic Review 91(5): 1454-1477. European Commission (2017), Competitiveness in low-income and low-growth regions – the lagging regions report, 10.4.2017 SWD(2017) 132 final. Fujita, M, P Krugman and A J Venables (1999), The Spatial Economy; Cities, Regions, and International Trade, MIT Press. Glaeser E L (2011), The Triumph of the City: How Our Greatest Invention Makes Us Richer, Smarter, Greener, Healthier, and Happier, Penguin. Iammarino, S, A Rodríguez-Poseand M Storper (2018), “Regional inequality in Europe: evidence, theory and policy implications ”, Journal of Economic Geography. Moreno, R, R Paci and S Usai (2005), “Geographical and sectoral clusters of innovation in Europe”, Annals of Regional Science 39: 715–739. Rodríguez-Pose, A (2018), ‘The revenge of the places that don’t matter (and what to do about it)”, Cambridge Journal of Regions, Economy and Society 11(1): 189-209. Scott, A and M Storper (2003), “Regions, globalization, development”, Regional Studies 37(6-7): 579-593. Storper, M (2018), “Separate Worlds? Explaining the current wave of regional economic polarisation”, Journal of Economic Geography 18: 247-70.